Split open the half pita as shown - so that you have two half-moons (two 1/4 pieces). Slice the whole pita in half. Spread mayonnaise on the lettuce and place your bacon. Lay down a layer of tomato on the bacon and dust with pepper. Place the 1/2 moon (quarter piece) of pita on top of the tomato and spread some mayonnaise (or mustard if you prefer). Optionally, place strips of fresh basil on chicken. Spread mayonnaise on another piece of lettuce, place it mayo side down on top of the chicken and fold the lettuce over into a half-moon bundle. Insert the bundle into the 1/2 pita pocket. Repeat the process with the rest of the pita. Want the total experience? Make your own Pita too! ... also known as the "Club Sandwich" or the "Double-Decker Sandwich" (and, occasionally as a "Triple-Decker" although this is a misnomer as it is missing one tier for a Triple Decker), this big sandwich is a real treat! The shortest possible description: "A BLT stacked on top of a chicken sandwich - sharing the middle slice of bread" ... except that this variation on this favourite, classic sandwich is made on pita rather than sliced bread. While on a classic clubhouse the meat is best cut from the breast (as it gives nice, big slices); with the Double Decker Clubhouse on Pita Sandwich, using the smaller pieces of dark meat cut from the thighs and legs (if you prefer those pieces in your sandwich) is a viable option as the contents of the sandwich sit inside a (pita) pocket and are unlikely to fall out while eating. We like to mix different types of lettuce and fresh basil when these are in season and available fresh from the garden. This contributes a nice set of flavours to the sandwich. This variation does not lend itself well to toasting. It is best on a fresh, soft, slightly chewy pita. Some will use mustard - some won't. Some will use mayonnaise - some won't. Some will use butter while others will not. Some use cheese - some don't. All variations of the clubhouse sandwich will work just as well on pita as they do on bread although the method of preparation will vary slightly. You can even toast your pita but we don't think it's a very good variation. Break rules - have fun with your sandwich. After all, it's yours, not ours! Even if "we" don't think it a "club sandwich", you may find the next, great, "Double-Decker on Pita"! This is our preferred "almost traditional clubhouse" sandwich. With a plate of slaw, some fries and a quarter or even a half of a sour dill pickle - that's a deli-prepared "Club Sandwich" except for this unique bread choice [described in a menu as] A double- or sometimes triple-decker sandwich with chicken, bacon, lettuce and tomato. Restaurants serving the Jewish community simply dropped the bacon - sometimes varying the name. So? 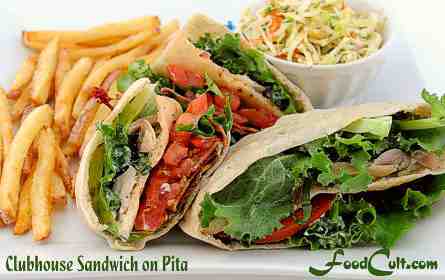 Make your own "club sandwich on pita" history - but don't forget to enjoy our traditional ingredients too! Considered trying it on home made pita? It's worth the extra effort! Prefer the classic double-decker clubhouse sandwich on sliced bread? Click Here for the recipe! Do you LOVE the traditional clubhouse sandwich? Get it as a wallpaper for your display @ WallpaperOriginals.com!